What did you like about the book? Mr. Clutterbuck, a goat, lives with his little friend Gus, a Guinea Pig. Mr. Clutterbuck is unaware that he is very active while sleeping; he rides in grocery carts causing huge crashes and chaos to others on vehicles. The next night he sleepwalks into a warehouse filled with sausages followed by a huge pack of dogs. He continues to have adventure after adventure totally unknown to him –but accompanied by the faithful Gus. Though Mr. Clutterbuck ‘s nighttime rambles bring about heroic changes, the townspeople finally gift him with a treadmill! This is a very fun story that kids will love. 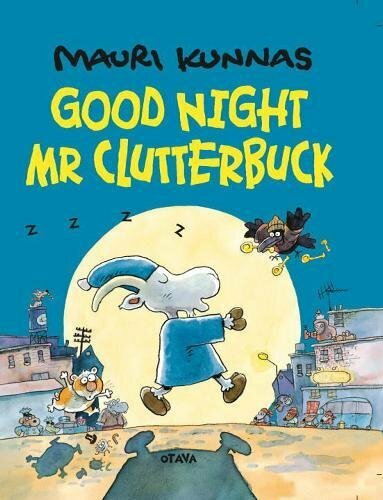 The exploits of Mr. Clutterbuck are finely and intricately detailed in the wonderful illustrations by Mauri Kunnas. Anything you did not like about this book? Not a thing. To whom would you recommend this book? Children (and adults) who like Sven Nordqvist and Marianne Dubuc should be delighted by this story. Should we (librarians) put this on the top of our “to read” piles? Not quite. This entry was posted in Book Review and tagged Elsewhere Editions, Penguin Random House. Bookmark the permalink.